Ilha Comprida, São Paulo State south coast. Located at the south coast of São Paulo State, Brasil, between the following cities: Iguape (Boqueirão Norte) and Cananéia (Boqueirão Sul). 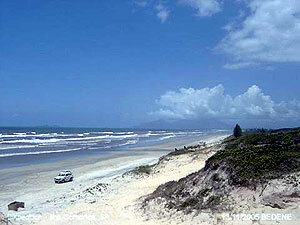 The island has more or less 70 Kms length and that's why is known as Ilha Comprida (Long Island). Its north region is well developed and the south has just small fisheries villages and riverine. We stayed at the "Noise Zero's Inn" (Pousada "Ruído Zero" in Portuguese). This place has this name because it is located at 12Kms from the south region in an uninhabited region far from electricity sources more than 8kms and it is in front of Atlantic Ocean. It makes this place a real "DXing paradise". The DXers arrived almost together during the afternoon on Friday/11, and we did not lost time! Then, we reserved our tables, started to set up our listening posts and extended a lot of wires outside towards several directions, and some wires were until 200 meter long. When the Gray Line came, we perceived that the propagation and our strategic position would bring us a good night with interesting catches, mainly in Medium Wave band. The big restaurant of the "Noise Zero's" Inn was used as our listening post. Our electricity source were batteries like AA cells and car batteries. We took a small electricity generator fed by gasoline that during the day was turned on to charge the bigger batteries and our laptops batteries too. To freeze the soda and beers, we used two icebox that during the morning were restocked with ice that was bought in a small village at more or less 8Km from us known as "Pedrinhas". On 11 and 12 (during the night) we received a lot of interesting Medium Wave stations from Africa and Middle East, making our Dxpedition a really successful initiative. We listened a lot of FM stations from Caribbean region too! Imagine how good could be listen to distant FM stations, far from us more than 5.000Kms and you will understand. Were listened shortwave, brodcasting, utility stations and NDBs too. Just the dinner was good enough to make the us leave temporarily our receivers, but they were wonderful moments that we shared our experiences, opinions and to know better our friends. A wonderful moment to have fun! Receivers: Kenwood R-2000, SONY ICF-SW6800, Kenwood R-5000, Icom IC-R75, SANGEAN ATS-803A, Sony ICF-SW2010, Sony ICF-SW55, Degen DE1103, Grundig YB400, Sony ICF-SW7600GR, Sony ICF-SW7600G, Philco Transglobe B481-3 and Sony ICF-SW35. Antennas: Loop 60cm, Ferrite loop RGP3, Loop "DEMA", Induction Coupler, Sony Active Antenna AN-LP1, DEGEN Active Antenna DE31, Loop "T51", FM Directional, DEGEN DE31 with support, Loop 45cm, a lot of LongWires (wires AWG 18, 22 and cables) with 100 and 200m towards several directions and a 40m long dipole. The FM stations were listened with the receivers telescopic antennas and with a directional antenna with 5 elements. 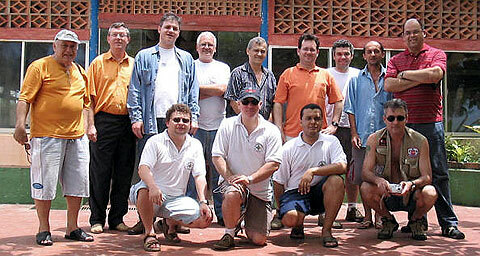 More pictures of the DXers during the DXpedition 2005 can be found on the Amantesdoradio website. Now we are sure without any kind of doubts that Ilha Comprida, and specially the "Noise Zero's Inn" is one of the best places for DXing in Brasil. Besides the beautiful landscape in front of the sea, we stayed in a place with all necessary structure for this kind of event and to the other events that will be true in a near future. 207 13/11 0102 TENT Marrocos, Azibal ?? The complete list available at Amantes do Radio website.